Program up to 12 beeping reminders, including reminder text messages that scroll across the display on the watch. These can include the name and strength of the medication or just a general task reminder. Used in Clinical Trials. Improve Patient Compliance / Medication Adherence. This e-pill timer is member tested & recommended by National Health & Wellness Club. Recommended by doctors, nurses, and emergency medical personnel. 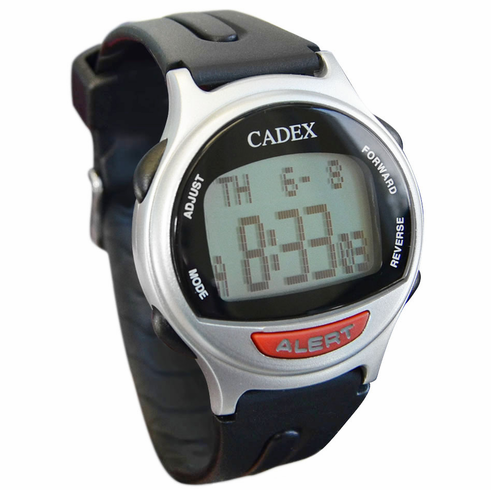 The e-pill CADEX's reminder system allows the user to turn off immediate beeping, then gives you a subtle double beep - called "medical snooze" - every three minutes until you have taken your medicines. You can also temporarily turn off all alarms easily. HIPAA Compliance Notice: This e-pill device, when used, may disclose confidential patient information. Size: 1 1/2" x 1/2" | Digits: 3/8"